When the local newspapers reported a Richard Corben exhibit at the famed Edgar Allan Poe Museum, this reviewer immediately sent an email to the museum curator, Chris Semtner. Upon his return from the Fourth International Edgar Allan Poe Conference in New York, my query was returned with enthusiasm. Mr. Semtner is clearly a dedicated scholar of the great American writer: occupying his curatorial post for the past fifteen years, he delights in expounding upon Poe, the rich history of the Poe Museum, and visual artists inspired by the master. Himself an accomplished painter of subjects full of mystery, Chris Semtner is the perfect individual to guide the art and artifacts of this institution. His photographic portrait accompanying this article accurately reflects his serious but calm demeanor. But the camera cannot capture words, and Semtner is ebullient in his praise of the artists represented at the Poe Museum. Richard Corben is a huge figure in the world of comic book art. No less a luminary than the legendary Harvey Kurtzman credited Corben with introducing air-brush technique into the field, thus introducing a new element of realism into the four-color printing process with his "sophisticated knowledge" of color and printing. Beginning in the 1960s in the underground field, he earned the respect of those such as Robert Crumb. Moving into the magazine market in the 1970s, he soon developed a dedicated fan following and received accolades from historic figures such as Will Eisner; in fact, Corben is now a member of the Eisner Award Hall of Fame. 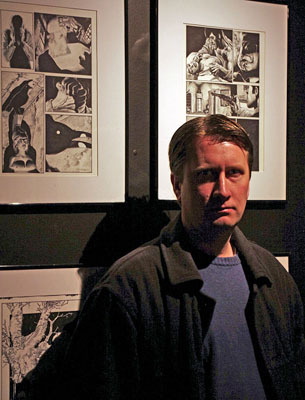 This art exhibit is a real coup in a continuing series of comic art exhibits at the Poe Museum, including a personal appearance by Michael Golden in 2013. The sense of rendered realism, a smoothness of the defined surface, is evident in about half of the works in this show, although there are no airbrush paintings. They are not needed. Entirely a black and white presentation, the framed pieces match the tone of Poe's stories as only a skilled draughtsman and imaginative creator can interpret. Numerous tales well known to the world are detailed either with the even, continuous tonality that made Corben famous or with a more traditional, linear style. 'Murders in the Rue Morgue', 'The Fall of the House of Usher', and, of course, 'The Raven' are all here. Not only are the stories told in pictures, the artist creates visual subplots that do not contradict the written word and introduces these unexpected elements into the mix. A consummate storyteller, Corben stretches his own imagination to prove worthy of the material. Published and unpublished art from 1974 - 2013 by Richard Corben are solemnly hung in an antique brick building on the grounds of the Poe Museum complex. In between projects for publishers such as Dark Horse or Marvel, the artist reports to Semtner that he continues to create Poe inspired drawings for his own edification, just as so many fine illustrators before him have done. In addition to much original art, a few printed examples displayed are in museum cases. 'Reimagining Poe: The Poe Illustrations of Richard Corben' continues through April 19, 2015. Upstairs from this terrific show the excitement continues in the dramatically red-painted 'Raven Room'. Here a genuine art treasure resides, a part of the permanent collection of the Poe Museum, illustrations of that famed poem by James Carling. This artist literally lived an Oliver Twist type of life as a child in Victorian London, surviving by his wits and artistic bravura as a sidewalk chalk artist. Finding his way to America, he found success as a 'quick draw' artist on the Vaudeville circuit, among other venues. Dying after only twenty nine years, it seems only a genius could produce such works rivaling the detail and scope of Gustave Doré, but that is what is on display, in mixed media drawings, changed every few months to make repeated visits quite worthwhile. Across from the Poe Room is another art gallery, this room occupied by the three dimensional shadow box constructions of Richmond, Virginia artist Nicole Pisaniello and her Poe contribution, 'Chambers of the Red Death: A Study in Light and Shadow'. Active in the RVA art scene not only as illustrator/sculptor, but also as an organizer of the Richmond branch of Dr. Sketchy's life-drawing group, Pisaniello here combines nineteenth century design sensibilities with contemporary materials such as LED lights and color gels. The explanatory poster by her also has a strong sense of graphic history, completing a very satisfactory visit into the mind of a great writer and three very able artists. 'Chambers of the Red Death' by Pisaniello continues through May 24th, 2015.